Thank you for all your kind comments about "Rug of the Day." I am humbled knowing that I had many readers coming back each day to see what was next. I am happy that I have inspired you! Now (sadly) I have to take a break, since I will be on the road teaching for the next two weeks and will have limited computer use. 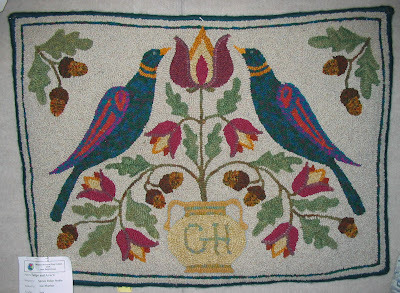 The rug of the day is Give Ye Thanks, adapted from Lori Brechlin folk art by Spruce Ridge Studios (c) 2007. This rug is hooked by Susan Pilotto. Wow! What a great autumn look! I love how Susan swirled those yummy colors into the hill/ground. And who wouldn't want to live in that wonderful rustic cabin? Great job, Susan! I took this picture at Sauder Village last summer. 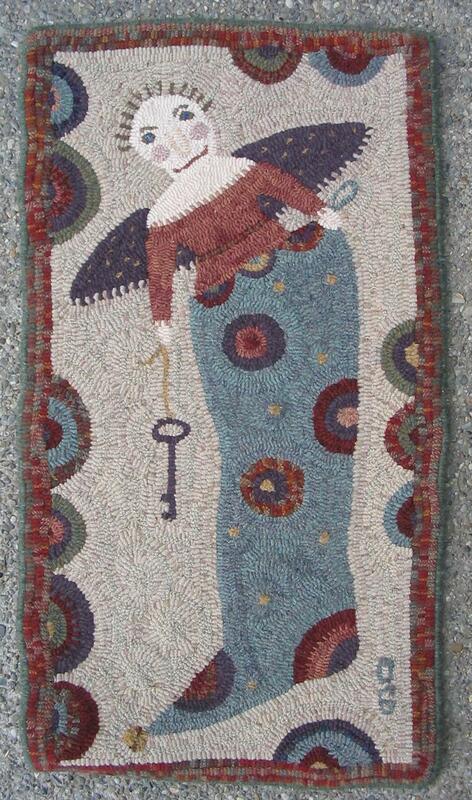 This rug is hooked by Barbara Hoffman. I love the addition of blue...very unexpected and very whimsical. I also love the red roof and door on the cabin. The background gives the rug an overall old "antique" feeling. The third rug is hooked by Jan Adler. 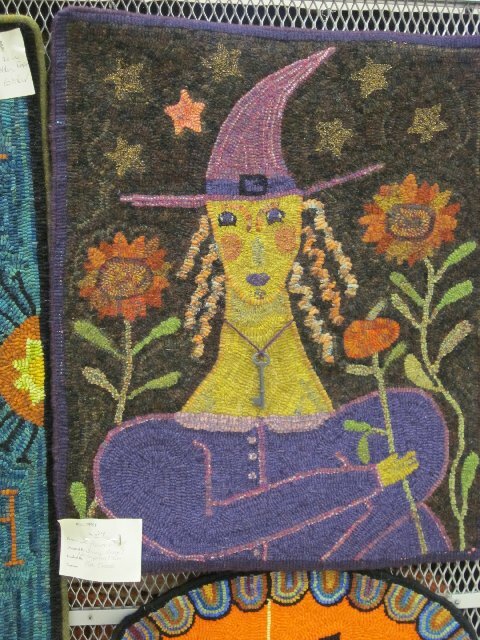 Her rug was on display at Sauder Village last year but this is the rug she worked on when she was in my workshop that I taught in Indianapolis in 2010. The dark background sets off the red and orange colors perfectly. I love the two-toned leaves! Again, these three rugs show the wonderful variety that can be executed with the same pattern...all have the same feeling of autumn and cozy-home-cabin, but still they are all different and contain the personality of the rug maker. I'll be back in two weeks with new rugs and new stories! PS: Forgot to post what my secret was (mentioned a few days ago): My Midnight Clear rug won an honorable mention spot in Celebrations XXII! WooHoo! The snow is coming down and swirling all around tonight! This rug was hooked by Rebecca Erb. As you might expect, I love the turquoise stocking. Her little doll has such a sweet face! This work in progress is Janet Kersh's rug. She was a student of mine at the Star of Texas Rug Camp in Fredericksburg last September. What a beautiful job she is doing on this rug! I love the gold dress with the "lace" trim and the multicolored wings. Her doll has a sweet face too. This rug was on display at Sauder Village last August and it was hooked by Alicia McLeod. She used brighter colors and says she "gave the angel the wistful look of a child's porcelain doll." I think the face is indeed lovely and I think it is wonderful that one pattern can be hooked up in so many different ways. I think this is another pattern that will be added to my bucket list! This sweet little mat was hooked by Ginny Westover. She purchased the pattern and wool kit from me and mounted it on a black board that was cut out in the same shape as the hooked piece. Ginny has it displayed perfectly! Here is my hooked version on display in my booth at the ATHA Biennial in October. My husband is a professional picture framer by trade and he always comes up with creative framing ideas. 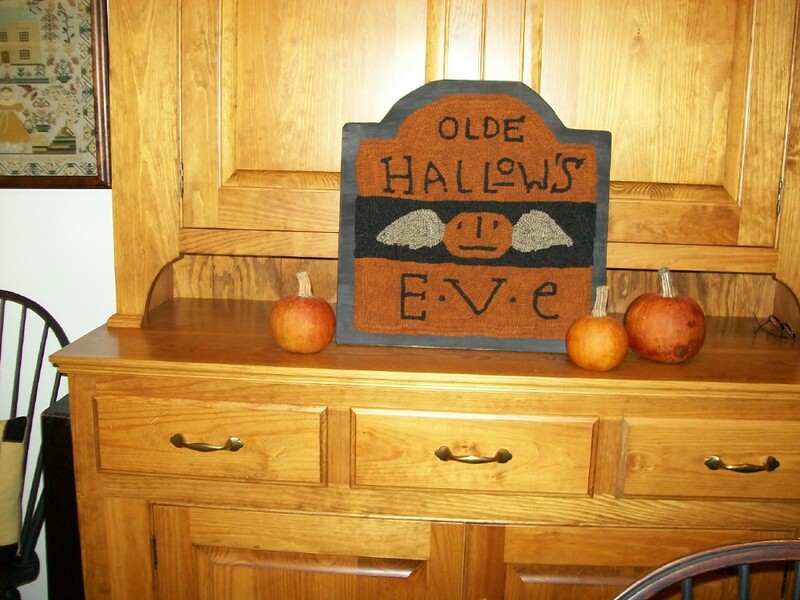 He made the gravestone out of wood and painted it with some type of textural paint to make it look like stonework. Throw in some leaves, moss, and a black crow...instant spooky grave! (I still have a few of these kits available...if you are interested, shoot me an e-mail). I have to be quick with my post today...my husband is down in my studio installing some new shelves for more wool. He is a gem of a guy! This is my hooked sample. Notice that the leaves on the trees start out darker and graduate into a lighter color at the ends of the branches. 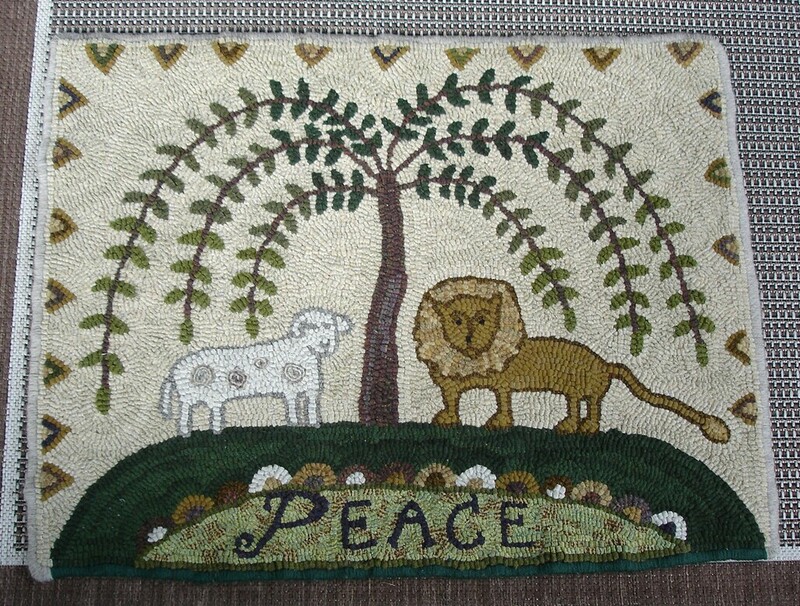 I used a golden striped wool for the lion's mane. So simple to do...just cut the wool, separate the stripes, and hook them in. The background is one of my favorites: I took 3 light textured wools and mixed them together in a plastic bag. I randomly pulled out the strips and hooked them as I pulled them out. 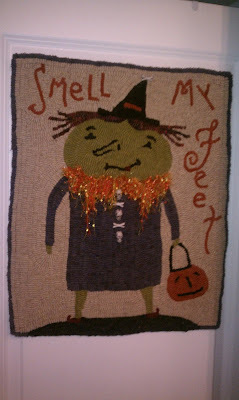 This was a very fun rug to hook! This Lion and Lamb rug was hooked by Margaret Pittman. She took a class from me a couple years ago and followed many of my hints for hooking the rug. I love her addition of quillie circles to the lamb. Even though this rug is not completed, I could not resist showing it. This rug was being hooked by Maureen Lowrey. She was my student at the Star of Texas rug camp in Fredericksburg this past September. Maureen has a good color sense and brought some fabulous wool to work with. First of all, I love the turquoise house! And I especially love the soft coral pomegranates at the top. I think the combination of turquoise and coral are the best ever. Don't you think the little goat is sweet? Here's a closer look at the house. And a closer look at one of the pomegranates. I have to admit, this is another pattern on my bucket list...maybe I'll have to move it up to the top of the list! Today's rug of the day was hooked by Janet Reid. It is another wonderful fraktur design adapted from PJ Rankin-Hults folk art by Spruce Ridge Studios (c) 2005. The name of the design is Tulip Bouquet. I love the colors in this rug, especially how Janet used the blue. I would not have considered it but it makes a huge impact in the overall color plan of this rug. I also think the dark background is stunning and the colors just glow against it (another surprise for me, since I tend to lean toward light backgrounds). The use of the plaid in the pot is like the icing on the cake. Wonderful! 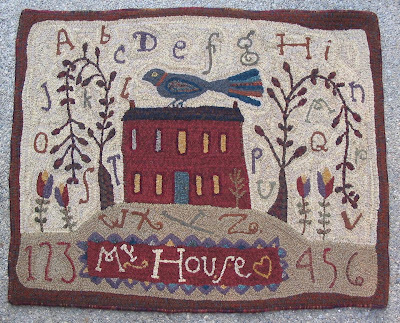 Today's rug of the day: A few more beautiful examples of My House Sampler. 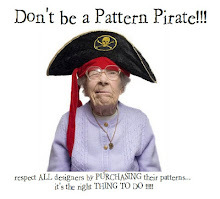 This is a great pattern that you can personalize to make it more meaningful. The rug was hooked by Diane Eaton. She attended a workshop I taught in Arizona about 3 years ago (oh my, how time flies!). Isn't it wonderful? I love the addition of her family name in place of the "my house" words. And I love the way she varied the colors in the alphabet. ...and Rebecca Erb hooked this beauty! All of these talented ladies hooked a red house and a light background...and I would probably do the same...I love, love, love to hook light backgrounds and I live in a red brick house (and my house is on a hill)! Ooh! I've got to hook this pattern!!! PS: For my dear readers who would like to learn to rug hook or are very basic beginners and live in this area, I will be teaching a beginner's class at Washtenaw Community College beginning Saturday January 21st. There are still openings available. Click on the "classes" link below for information. 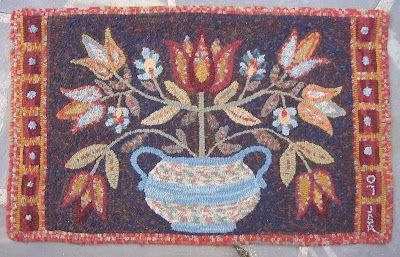 Primitive Rug Hooking 1 - Classes. 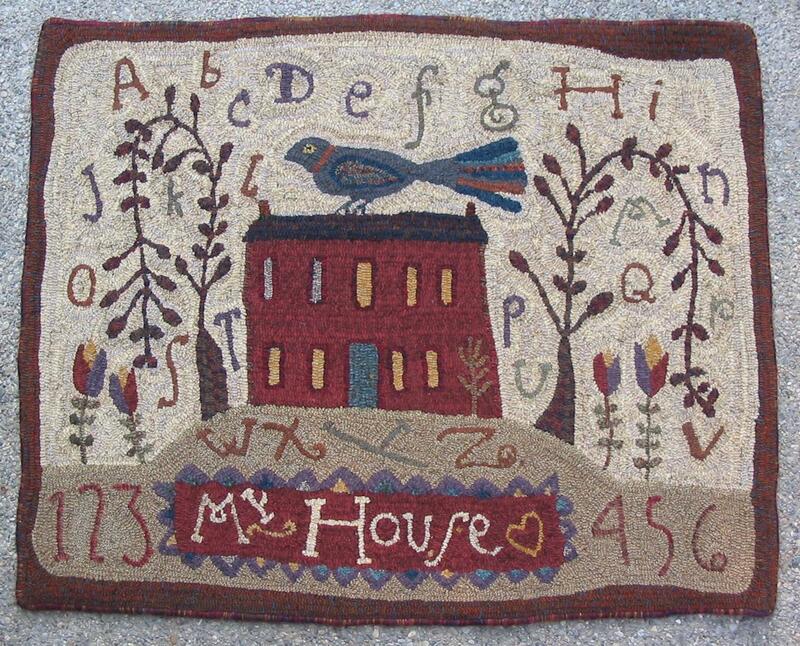 My House Sampler is the rug of the day. The first rug is hooked by Linda Long. No surprise here...I love Linda's use of turquoise! The next rug is hooked by Linda Thraen. She changed it up a little so the rug says "Our House." I love the red up against the dark background...and again a gorgeous turquoise bird! Often times on a summer's evening when I am down at the barn feeding my animals, I have turned around to look at our house and have seen a lone mourning dove perched right on the top of our roof. As the dusky light emphasizes the bird's silhouette, it reminds me so much of this pattern and I just have to smile to myself. This is definitely another rug that is on my bucket list. 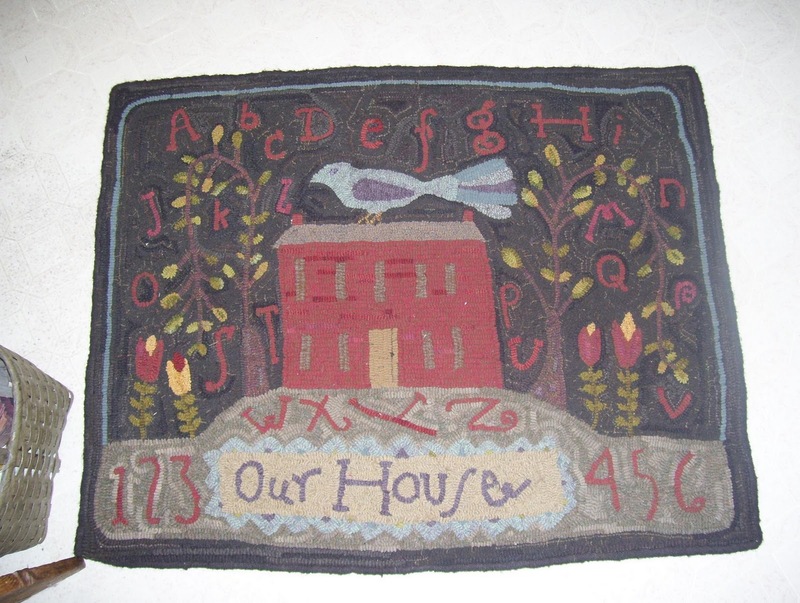 I have a couple more great examples of My House Sampler to show you tomorrow! The rug of the day is Kissin' Wears Out! This version is hooked by Vicki Monroe. She was in my class at the Heirlooms Rug School in Holland, MI in 2010 and we worked on her color plan. She gave this to her brother and new sister-in-law as a wedding gift. How wonderful! Of course I love the turquoise dress and also the addition of beading to the bottom of the apron. The second version is hooked by Marie McDonald. She had this on display in the rug exhibit at the Heirlooms Rug School in July 2011 (the photo quality is a little washed out because it was displayed in a very sunny room!). Marie hooked this to commemorate her anniversary. I love how she added the saying at the bottom of the rug "United are we for life"....and is that a golf club in the gent's hand!?! Perfect! I also love the fraktur colors both these ladies have used. Since this pattern has a fraktur feel to it anyway, their color choices enhance the whole effect of the rug. Bravo! 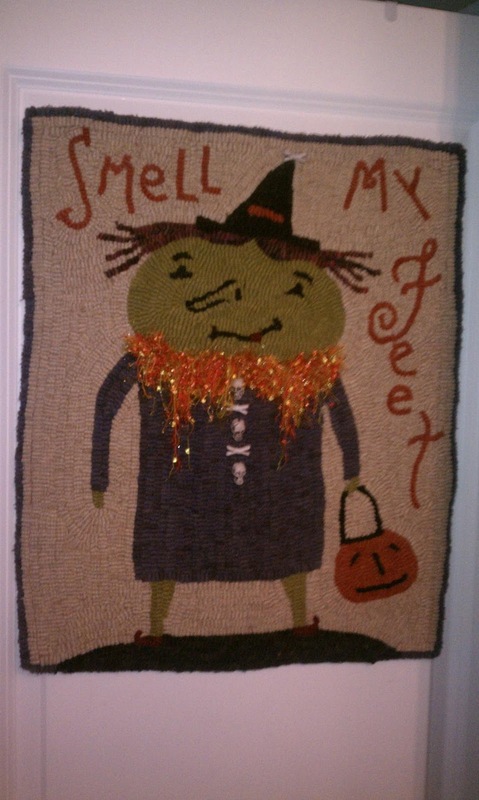 This rug is hooked by Deb Wilson. As many of you know, I have mad-crazy-love for the colors turquoise and aqua. I use it a lot in my own rugs. Have you ever heard anyone say that if you are having trouble with a color plan, just add a little purple? Well, to me it's "just add a little turquoise!" It is my "go-to" color and it makes me happy. So, of course, I love Deb's use of the turquoise in this rug. Here is my version of the pattern. As you can see, I used a wonderful turquoise and purple plaid for the background. The rabbit was hooked with a Harris tweed that I picked up at Sauder Village years ago. It was a small piece of plaid but oh, was it spectacular! I loved the way this rug turned out. This was being hooked by Becky Marshall who was my student at Star of Texas, Fredericksburg last September. Becky has an extraordinary sense of color and her rug is going to be spectacular. I love those turquoise flowers!!! This little rug design always makes me smile when I see it! It is the perfect pattern to try all kinds of embellishments and fun techniques. 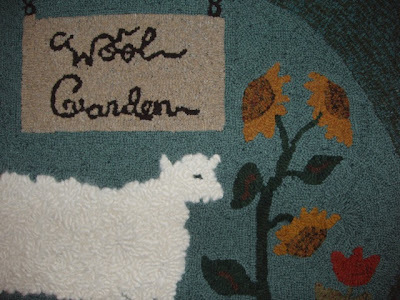 Susan Walsdorf hooked the rug pictured above. I love the glittery yarn used as a lush collar for the dress. The skull and cross-bones buttons Susan added are just THE best! Here is my version of the pattern, with sheep curls for hair, proddy accents, beading, and old black glass buttons for the dress . 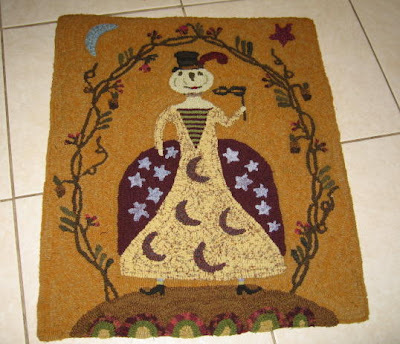 This rug pattern also has a companion piece called Trick or Treat. I started hooking it at the end of October, but had to put it away due to other obligations. Another UFO that I need to finish! The sun is shining brightly today and my sheep are basking in its warmth. It is a nice day, finally! 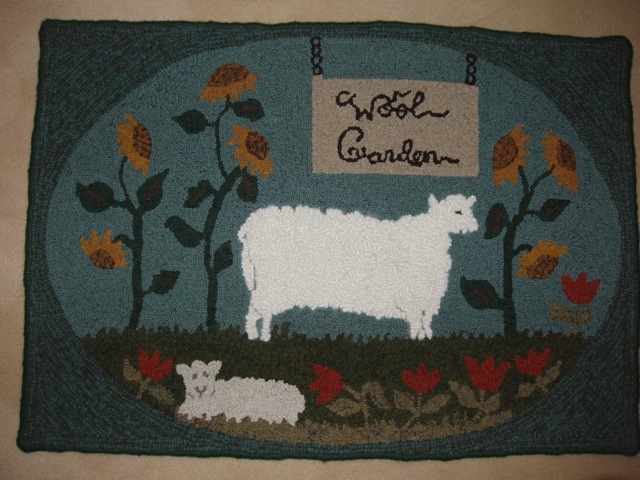 Let's celebrate the sunshine with Wool Garden! This beautiful rug was hooked by Phyllis Monjar last June when I taught a workshop for her group in Libertyville, IL. I had fun with this great group of ladies. I love, love, love how the turquoise blue background and border work with each other. And the beautiful sunflowers. And the gorgeous red tulips. And the very calm and gentle sheep. Phyllis hooked the big sheep with roving. She says this rug will be hanging in her own Wool Garden room. Today's rug is a design that is probably one of my all-time favorites. Tropical Leopard (designed by Kris Miller/Spruce Ridge Studios (c) 2005). This rug is hooked by Linda Woodbury. 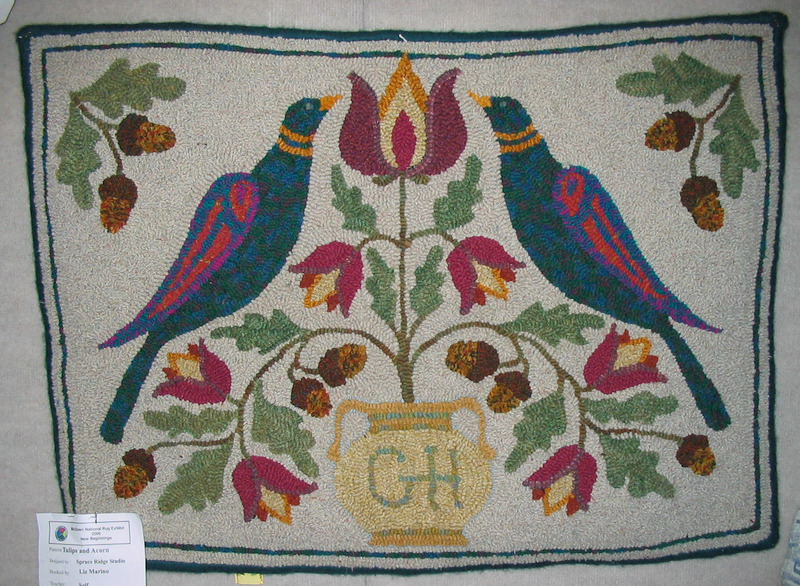 It was on display at the Chalfonte Hotel in Cape May during the 2010 Rugs By The Sea rug camp. I had actually helped Linda with her color plan when I was teaching at the Ohio Rug Camp the year before. I love Linda's color sense and she had some definite ideas about how she wanted to hook it. Her night sky is amazing and so are her purple stars and blue-hued leaves. Barb Carroll had color planned this for me some years ago when I attended a three-day class at the Woolly Fox. It was one of the rare times that I did not bring much wool. In fact, maybe two pieces of overdyed wool and a piece of paisley (used in the palm fronds). All the rest of the textures were from Barb's wonderful treasury of wool. I think this is still my favorite rug of all time. I loved pulling up every loop! A couple of people have told me that my leopard reminds them of the creatures in the Edward Hicks painting Peaceable Kingdom. A high compliment indeed! PS: The Antique Hearts will be available as a pattern ... stay tuned for details!